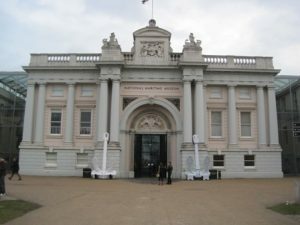 The National Maritime Museum is in the north west corner of Greenwich Park and faces north towards the River Thames. The museum is a part of the Maritime Greenwich World Heritage Site which also incorporates the Royal Observatory, Greenwich, and 17th-century Queen’s House. The museum’s collection of more than 2 million objects includes: maritime art, maps, manuscripts, ships logs, ship models, ship plans, scientific and navigational instrumentsand a historical reference library. The ground floor galleries include exhibitions on sea exploration and London’s history as a port, on display are the uniform that Nelson was wearing when he died, the golden barge built in 1732 for Frederick Prince of Wales and Miss Britain III the first boat to reach 100mph). On the upper levels are further displays including interactive exhibits for children: a simulator of a ship’s helm, gunnery and cargo handling. The National Maritime Museum is open every day from 10:00 am to 5:00 pm and entry is free although there may be a charge for temporary special exhibitions..